Interested in buying the best garden tiller? You’re at the right place. 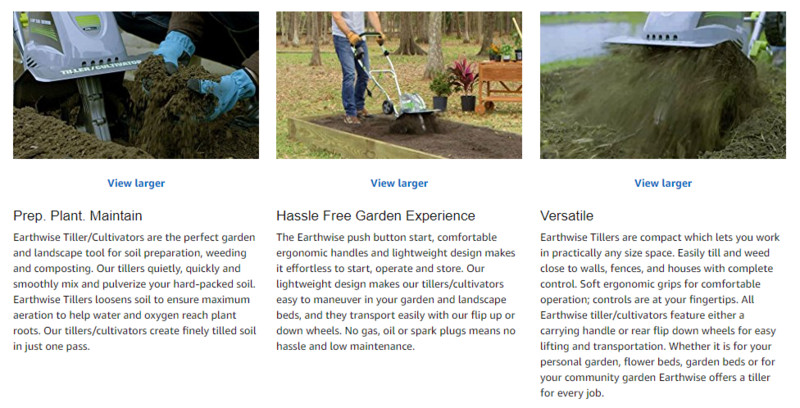 On this website, you’ll find my unbiased garden tiller reviews as well as several helpful articles on using garden tillers the right way. Overturning and preparing a garden for planting can be exhausting and tedious work. Using garden tillers is the most efficient and back-saving ways for the gardener to accomplish this necessary task. Garden tillers save a great deal of time when compared to turning the soil with a shovel and break up weeds at the same time. Garden tillers play a major role in maintaining gardens as well as preparing them for planting. Two types of tillers can specialize in different gardening capabilities: The front-tine tiller type is slim and compact and accomplishes weed control quite well. The bigger rear-tine tiller type can till larger areas efficiently and can cut through the roots of small trees. The operator of the tiller can choose the depth that the tines will dig by using the depth bar adjuster. The steel blades which rotate and perform the actual labor of the garden tiller are called tines. These tines dig into and break apart the ground, turning the soil. The placement of the tines on the tiller, either in front or the rear, dictates major differences between the two types. It’s hard to beat the value of the Earthwise TC70001 with its 11-inch cutting width and an 8 and a half inch cutting depth with dual four blade steel tines. It weighs about 27 pounds, and it shouldn’t bounce too much when you’re tilling with it, but you should probably have some good quality gripping gloves to help you hold the tiller on the ground. The design is well built for this EarthWise tiller even if the picture of this tiller makes it look a little bit flimsy. 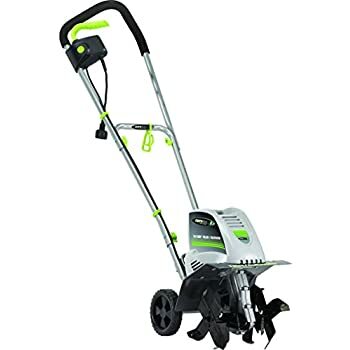 It is an electric tiller, so it obviously doesn’t run on gas, and you will need to get an electric cord, and you may also want to consider budgeting a few bucks for a decent cord reel to make things a little bit easier to manage. It’s very easy to put together if you’re ordering it online which we recommend and it shouldn’t take you any more than 20 min. And you probably would be able to save a little bit of money ordering it online. The EarthWise TC70001 is probably not the best tiller for large gardens, but I’m sure you’ve been you considered that. 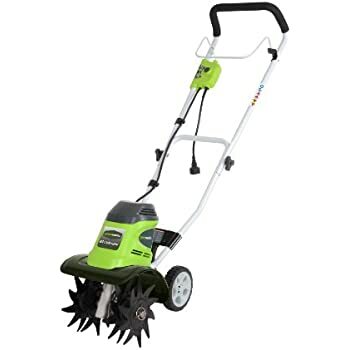 It’s a great little convenient and efficient killer for tilling up to 10 inches deep in small gardening areas. It should be able to break up fairly hard ground without an issue, but don’t expect it to turn up huge rocks and roots. 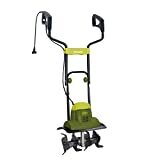 Go ahead and check out the EarthWise TC70001 electric cultivator at Amazon to get a great price. The Sun Joe Tiller was a snap to put together – it came practically ready to go. It’s nice and quiet, compared to the gas-powered tillers. It’s lightweight and has comfortable ergonomic handles. In other words, it was more pleasant to work with than the big gas-powered tillers I’d gotten used to. The convenience of not having to deal with oil and gas, too, is part of makes this tiller well worth the investment. The four tines are steel blades that are set to loosen a tough surface. It took a little bit of figuring how to hold this tiller and move along with it, but once I did, it works beautifully. Taking a second pass helps get the greater depth, and my wife enjoys taking a turn with that step. I never thought I’d want to mess with an electric cord, since they can get in the way, but the way it’s designed, it does a pretty good job of keeping the cord out of the way. Since I don’t have to deal with buying gas or worry about anything like dead batteries, dealing with the cord is worth it. The tiller got caught on a large rock at one point, but it did no damage. The tiller stopped itself, and I was able to dislodge the rock. Nothing happened to the time, and it just started right back up. I’m totally surprised at how durable this little Sun Joe Tiller is for the weight and cost. The 6-5 amp electric motor does the job. Like I mentioned, there’s a safety switch that prevents accidental start-ups. Since my wife plans to use the tiller, too, for flower gardening, I’m just glad to know it’s safe for her to use. I’m probably thinking about the fact that we often have a lot of kids around, between neighbor children and our young grandkids. Starting with a push of a button is just so easy, and the ergonomic handle I think makes a difference. I’m not sore at all using this tiller, and my wife hardly has a complaint after using it, either. I’m saving one of the best things to mention for last because I love that this tiller hardly takes up any storage space. If you ever saw my garage, you’d know why that’s important. Easy storage. The Sun Joe Tiller has a folding handle that makes it easy to store it, and it takes up almost no space at all. Reasonable price. Buying this tiller really saves us a lot compared to renting tillers when needed, which makes the reasonable price worth even more. It’s electric. Not having to deal with the gas and oil makes tilling that much less of a hassle. It’s tough. For a small tiller, it does a really big job. Small rock and hard ground haven’t been a problem for the motor or the sturdy tines. You have to deal with the cord. The fact that the Sun Joe Tiller is electric is both a pro and a con for me because, in spite of all the conveniences, there’s a part of me that still doesn’t like dealing with a cord. Using it takes a little practice. This is a lightweight tiller and has tines that are situated on hard ground, and basically, it takes a little figuring to know how to hold it and move it, to get the best out of it. 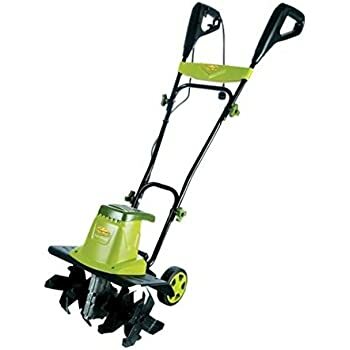 I would recommend to anyone who has a garden not to rent tillers but instead to buy the Sun Joe TJ600E Tiller Joe Garden 14-Inch 6.5 amp Electric Tiller/Cultivator. It’s lightweight, convenient, powerful, sturdy, easy to use, and easy to store. Especially for the price, I know I couldn’t ask for more out of a tiller. 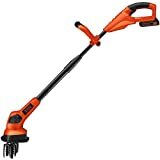 After working for many years with either a heavy-duty tiller or a hand shovel, I finally got smart and bought the Black & Decker LGC120 20V Lithium-Ion Cordless Electric Garden Cultivator. All I can say is what the heck took me so long? Weeding is easy and now a pleasure rather than a burden. 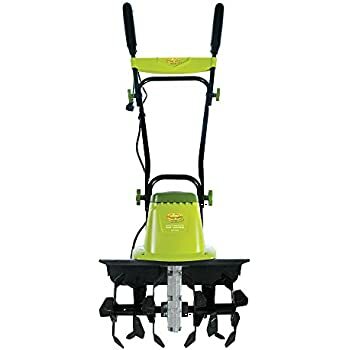 This 8-pound cultivator has a soft grip and is comfortable to use, with the telescoping handle, eliminating a lot of muscle pain and strain. The tines are durable; and this cordless, battery-powered cultivator comes with a two-year warranty. It’s important to understand when you get this tool what it’s for. It’s not a tiller and isn’t designed to do the work of a large tiller. This is an ideal cultivator that eliminates the kind of job that I’ve been accustomed to doing manually. My flower beds and garden has never looked better as this cordless cultivator quickly aerates the soil, which it has plenty of power to do. It also fertilizes with ease. Weeding is no longer the back-breaker it used to be. The Black & Decker Cultivator easily pulls up the weeds and can be maneuvered between plants with no problem. All I have to do now is rake up the weeds because the cultivator does the rest. Now, if you’ve ever gardened much, you know that this is no small thing, to have your weed problem solved. 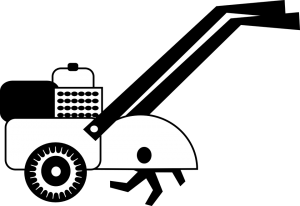 The design is pretty great on this cultivator. It weighs only 8 pounds, so it’s very light. And it has a soft grip, telescoping handle that keeps you from having to do a lot of bending over. You can’t beat this Black & Decker cultivator for portability. The fact that this cultivator is cordless is a real plus. You don’t have to worry about damaging plants as you work with it. And the battery lasts long enough that with one extra charged battery, I’m satisfied with the length of time I can work before needing to recharge because it has plenty of power to do the job. It’s also durable. I’ve bounced the tines off of rock and concrete, and no damage was done. Does what it’s made to do. You can get your wedding and soil preparation done quickly with this handy garden cultivator. Easy on the back. The design and weight make for gardening that doesn’t create back pain or strain and doesn’t require any significant upper body strength. No cords to deal with. When you’re working between tender, growing plants, a cord can be a real problem. So the cordless aspect of this garden tiller is terrific. Quiet and energy-efficient. Working in the garden with a quieter, energy-efficient tool just beats the loud gasoline-powered tools. Battery life. If you want to work for an extended period, you may want to get extra batteries charged up and ready; otherwise, the battery lasts only so long – depending on what you’re working on — and then has to be recharged. Not for breaking hard soil. You just need to be careful to use this tiller for what it’s made to do, or you’ll get frustrated because it’s not a replacement for a heavy duty tiller. I give this tool an enthusiastic five stars for all the time and backache it has saved me to use it for weeding and keeping the soil aerated. I use it almost daily just to keep my gardens looking tip-top. This is a durable cultivator that’s incredibly portable and effective. In my opinion, it’s a must-have for any serious gardener. Kickstand, not sure it would have the power I needed. I got a pleasant surprise because the Mantis Tiller has exceeded my expectations. It’s powerful, lightweight, easy to start, environmentally friendly, incredibly quiet, and gets the job done. This season I broke ground on some new flower beds, and the Mantis performed better than expected. The electric motor is plenty powerful for heavy duty jobs. Not having to hassle with gas and oil is a big plus. Start-up is a cinch. All you have to do to start it is pull the trigger. This Mantis Electric Tiller weighs only 21 pounds and yet does the job of heavy equipment. It doesn’t take up much space to store. It’s easy to maneuver it, and I use it for tilling, cultivating, and edging. This electric motor is so quiet; it’s fantastic. After working with a lot of different gardening tools over the years, it’s just unbelievable to have the experience of using such a quiet and at the same time heavy duty piece of machinery. You don’t have to worry about disturbing sleeping neighbors with this gem. One word of caution is that it’s best not to use this tiller if the soil is saturated. If it’s gummy, the machine will tend to stop. Resetting it is easy enough, though. It’s just easier to let the soil dry out some. Another thing is that the kickstand is handy once it’s installed, but installing the kickstand is difficult if you don’t have tools for working in very tight spaces. I finally borrowed a tool from a neighbor that worked to get it installed. It’s unbelievably quiet. Feel free to work at sunup on a Saturday because the neighbors won’t be bothered; this tiller is so incredibly quiet. It has the convenience of being electric. It’s a huge benefit, not having to deal with gas and oil and a noisy gas-powered motor. It’s powerful. Why put up with all the noise and hassle of gas-powered when you can have a quiet tool that is still powerful enough to get the job done? It’s lightweight. This tiller is only 21 pounds and is easy to maneuver. Assembly is a bit of a challenge. Not so much the entire tiller, which was easy to assemble for the most part, but the kickstand was a challenge because it’s such a tight spot you’re working with. Not as effective in the wet soil. The tines get clogged up with gummy soil if the ground is too wet, and the machine will stop. It’s simple to reset the machine, though. And the other solution is to wait until the soils aren’t so saturated, and then it works beautifully. Buying the Mantis Corded Electric Tiller Cultivator 7250 with Touch-Start with Border Edger and Kickstand was a wise decision for me. The best feature is how quiet the motor is while doing heavy duty work. The electric cord isn’t a problem, and you don’t have to deal with gasoline or the gas fumes. Storage is easy. The tines are sturdy and guaranteed for the life of the tiller. Get this powerful, lightweight tiller; and you won’t be sorry. I’m finally back to serious gardening after too many years focused on building my business. The area I’m working isn’t huge, just a quarter of my backyard. I decided to get the Troy-Bilt TB154E Electric Front Tine Garden Tiller instead of a larger, gas-powered tiller, and I’m glad I did. This tiller came pretty much assembled. All I had to do was attach the handle, and no tools were required. It’s a pleasure to use, and the 8-inch steel tines are simple to clean. I’d done some shopping around before buying the Troy-Bilt because I didn’t want to buy a machine that was less than what I needed for my soil. The Troy-Bilt has no problems cutting through small roots. It never has gotten jammed or bent by rocks. The tines are extremely tough and can get the job done with no hassles. It works better when the soil is already loosened up a bit. If it’s not loose, the tiller will still do the work; but it jumps back and then steadily digs down. The tilling width is adjustable – from 6 to 10 ¼ inches – and the depth is also adjustable, digging as far down as 8 inches. I was glad to buy Troy-built because I like to buy American-made, but based on some of the reviews, I’m not sure that’s entirely right. In any case, Troy-Bilt is a company known for excellence, and it at least introduced the first American-made tillers. There’s no debate about the reliability of this Troy-Bilt tiller, and it has a 2-year warranty. It’s easy to use. Just attach it to an extension cord, and you’re good to go. It’s nice that you don’t have to mess with oil and gas, and it stores conveniently in the garage. The cord-minder helps keep the extension cord in check as it says. I have a daughter who liked to help me in the garden when she was a little girl. Between her college classes and studying, she helped me till the soil with this Troy-built, and she can even handle the lightweight machine with no difficulty. Clean-up is easy. Cleaning the tines after use is a hassle-free process. Practically pre-assembled. All I had to do was attach the handle on the tiller, and a tool wasn’t needed. The rest of the machine was already put together and ready to go. It’s powerful. This tiller is lightweight, but it does a heavy-duty job. It got the job done, and I know I could use it for a lot bigger job with no problem. It’s sturdy. Rocks and roots were no match for this tiller and caused no bending or jamming. The wheels could use a redesign. The tiller can fall over quickly if it’s resting on its wheels, and it’s not that easy to use the wheels for transport, such as on stairs. But overall, they work fine enough. Bounces back a little on unchurned dirt. The Troy-Bilt does a fantastic job once it’s in the dirt, but it bounces back a bit on the hard ground. That’s pretty typical for all tillers, though. The Troy-Bilt TB154E 6.5 Amp Electric Front Tine Forward Rotating Garden Tiller/Cultivator With Adjustable Tilling Width is easy to assemble, convenient as long as you have a decent extension cord, and the sturdy 8-inch steel tines are easy to clean. Most importantly, this cultivator does a great job of tilling the ground. Even medium rocks are no problem, and it cut right through every root we’ve encountered. I give this lightweight electric tiller the highest rating and would recommend it to anyone. Front-tine tillers – These tillers feature the placement of the tines underneath the engine and forward of the tiller’s drive wheels. This type is best suited to work on the soft ground. This is the type used for relatively easy jobs like previously tilled soil. The reason for this is that these tines only rotate in the forward direction which effectively pulls the machine across the hard ground as opposed to tilling it. Rear-tine tillers – These tillers have the tines placed behind the tiller’s drive wheels. This is the more powerful type of tiller with stronger digging capability. There is a safety shield of metal covering the tine area to minimize the danger of flying debris, rocks and dirt. The operation of this type of tiller will be powered by either standard rotating tines or counter-rotating tines. These are referred to as SRT or CRT. Standard Rotating Tine (SRT) – On this type of tiller, the wheels and the tines rotate in exactly same direction. These models are heavyweight and can break up relatively hard ground. This category also has superior compost mixing and fertilizer distribution capabilities due to the rotation direction the wheels and the tines go. Counter Rotating Tine (CRT) – On this type of tiller, the tines and drive wheels rotate in opposing directions. The rotation of the tines presents resistance to the forward-moving action of the wheels. This allows tines to most effectively chew and break hard ground. CRT models are the ideal choice for establishing new gardens or tilling large areas. CRT/SRT Combinations – There are some models of tillers in which the tine rotation can be switched between the two options. This gives the operator the advantages of both functions. There are many different kinds of tillers available for various applications. Some types are more suited to home or residential gardening while others are more appropriate for commercial operations. Choosing the best garden tiller for your purposes involves an evaluation of your future gardening plans. This is important so as not to purchase a tiller that won’t prove obsolete about your future needs. Here are some factors to consider when choosing garden tillers. Front vs. Rear-tine tillers. Front or mid-tine type tillers propel the tiller forward while digging and usually necessitate several passes to prepare the planting area soil adequately. These types of tillers are best choices for small or medium-sized tasks. Although this type may require more labor from the operator, they usually cost less than the rear-tine type. Larger jobs are more appropriately handled by the rear-tine type of tiller. This is a heavier machine that requires less effort on the part of the operator than the other type. Type of Ground. Preparation of the ground, especially hard ground, is best accomplished by rear-tine tillers because of the powered wheels on most models. Front tine tillers or mini tillers should be used for softer ground. How much will you till? Mini-tillers with the front-line operation are sufficient for residential gardening. They usually weigh around twenty pounds. These types cost less than the heavier tillers and are all that a medium sized garden requires for preparation. These compact tillers are capable of many tasks and often come with hole-digging features. But if you have a lot of ground to till, you should consider getting a larger rear-tine tiller. Horsepower. Garden tiller prices vary according to the brand, model, and power. The horsepower measurements usually range from one to eight. Tillers with higher horsepower require less effort from the operator as they tend to pull themselves through the soil. Models with lower horsepower take more manual effort from the operator. Warranty/Repairs. Other considerations when purchasing your garden tiller is its depth capacity and the coverage of warranty. Depending on your planting needs, the limited depth of some tillers may take them out of the running. Reputable manufacturers offer warranties on their tillers. They usually vary in coverage being either for parts and repair or replacement. This is a very important consideration as you will probably never intend to replace your garden tiller. Some tillers are advertised on television as having the capability of one-hand operation in soft soil. Though tempting, it’s rarely soft soil you needed to be tilled. The investment in your garden tiller warrants some research. A great way to evaluate your options is to rent a couple of different types of tillers from your local supply store to evaluate the best choice for your needs. Gardening can be a much more enjoyable process with the use of your garden tiller. It saves on strenuous labor and time taken before you can get to the garden you want. Be sure to take into account the power, size and type of tiller you need as well as the availability of a good warranty. Garden tillers are an investment that should fulfill your gardening needs for many years. You till the garden every year. Instead of asking for your neighbor’s garden tiller once more, shop and compare tillers so that you are equipped with your own for this annual chore. While shopping for tillers, be aware of additional features that will give you more performance for the money. As long as you have some familiarity with the features you desire, you can shop online or at a garden supply or discount store near you. Decide on the type of tiller best suited for your needs. Your choices include front-tine type, rear-tine type or mini-cultivators. Mini-cultivators are good for areas of soft soil that are smaller than one thousand square feet. Front-tine type tillers are best for areas of five thousand square feet or less of soft soil. Rear-tine tillers are best for areas of five thousand square feet or more and hard soil. Mini-tillers should be compared for use in smaller garden areas. These are best used for areas of three hundred square feet or less. Shrub planting and patch reseeding in the lawn are tasks the mini-tiller can take care of. Tough soil can be filled well by the more powerful and durable gas powered mini-tillers. Mini-tillers powered by electricity is less expensive and weigh less, but require outlet access near the work area which can cause the cord to tangle in the garden’s plants and shrubbery. The width of the tills is an important consideration. Till-width will determine the amount of land that can be tilled at once. Tiller blades on mini-cultivators are roughly eight inches wide. Full-size tillers can have blades of 24 inches in width. Horsepower is another consideration when choosing a garden tiller. The more horsepower a tiller has, the more power it has to dig into and through the hard and tough soil. You need to evaluate available features of each tiller to decide which will be the best choice for you. Blades that are self-sharpening, self-propelled transmissions, ergonomic designs, and reverse capabilities are all features that can benefit your annual tilling experience. Extra features cost more, but the increased efficiency and convenience may be worth it. Garden tillers are available in several price ranges. In the year 2010, mini-tillers powered by electricity ranged in price from $150 up to $300 and gas-powered mini-tillers ranged from $200 up to $400. Larger tillers can range in price from $600 up to $2,000. Effecting small repairs and maintenance yourself is an efficient thing to do, especially with the economy as it is. Not only does it save money, but it’s also fun getting your own hands dirty from time to time. To change the oil of the garden tiller, begin by placing the tiller on top of a thick layer of the newspaper you have spread to catch any spillage. Locate the tiller’s oil drain plug. Smaller engines will have it towards the bottom section in the front or the back of the engine. The plug usually has four sides to it. If you can’t find it, look your model up on the web for a diagram. Adjust the wrench to fit the drain plug tightly and rotate counter-clockwise to remove. Remember, “loosely lefty and tightly righty” to remind yourself which way things turn. Oil will start to leak from the hole when the plug’s almost removed. The oil that has started to leak lets you know where to place the pan to catch oil when it comes out. When the plug’s completely removed, the remainder of oil will drain quickly. Clean the area surrounding the drain with paper towels or rags before replacing the plug. Don’t tighten your plug too much when you screw it back in. Consult your owner’s manual to know the recommended quantity and grade of oil. Fill accordingly. To finish, check the plug area for leaks and dispose of the newspapers. Carburetor cleaner is very effective for cleaning the oil off the floor and tiller. Use caution, though. If the fluid is allowed to sit for too long, the paint will come off. Rototillers are available as two basic types: Rear-tine and front-line. Although both effectively turn the soil, the front-line type rototiller is usually the preference of gardeners of small plots due to its easy mobility. This type of rototiller can either be powered by gas or electricity. The operations of tillers of both power sources are identical, and they work equally well. Starting the rototiller requires the power switch flipped on electric models or a starter rope being pulled on gas-powered models. The rototiller should be wheeled to the starting point on the rear wheels. At the starting point, continue to balance on rear wheels while squeezing the lever that activates the tines. The tines are now rotating. Lower the tines in the front of the tiller to the ground. The rotation of these tines will pull you and your tiller along as they till and turn the soil. Guiding is easy while the tines are engaged. Continue guiding the rototiller as it breaks up soil. Keep the tiller clear of obstacles and move along pathways in a forward and back motion to achieve maximum tilling. If you need the tiller to dig in deeper than it has, turn it off after initial pass and remove the tilled soil with a shovel. Take another pass at the soil from this deeper level. Repeat until the desired depth is achieved. Put dirt back. Wet soil is easier for front tines to till and break up. Keep feet and hands clear of rotating tines and wear gardening gloves to prevent blisters during the rototiller operation.